Two Turbomiser chillers are cooling high power lasers and clean rooms at Photronics’ high-tech production facility in South Wales. The company is a world leader in the production of specialist components for semiconductor and flat panel display manufacturers. 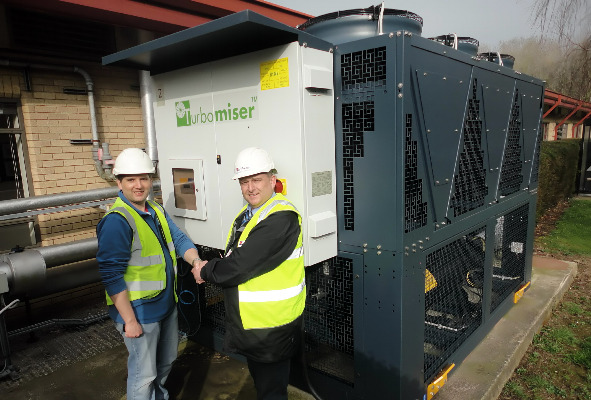 The recent installation, carried out by Cool-Therm’s Cardiff branch at Photronic’s Bridgend facility, involves two model TMA300 Turbomiser chillers, rated at 300kW each, which replaced aging Trane and Climate units running on R22 and the interim refrigerant R79. Since the Turbomisers were installed, energy consumption for cooling at the plant has been halved. With a fairly constant process load throughout the year, this is anticipated to give a pay-back on the project in less that two years. A key requirement was that the replacement chillers had to operate with very low noise and deliver high efficiency, reliable cooling. In addition, as Photronics operates a 24/7 continuous process business, there had to be continuity of cooling during the change-over and high resilience once up and running. The chillers cool clean rooms and supply vital cooling for manufacturing lasers which cut masks for high-end IT products.